Banjo was rescued from a factory farm with seven other turkeys. She was just two months old when she arrived at the sanctuary and had already been cruelly de-beaked and de-toed without anaesthetic or painkillers – a routine practice in the industry. Since arriving, Banjo has made friends with the other residents and enjoys napping in the sun. Banjo is still the shyest but start stroking her feathers and she will fall asleep right next to you. 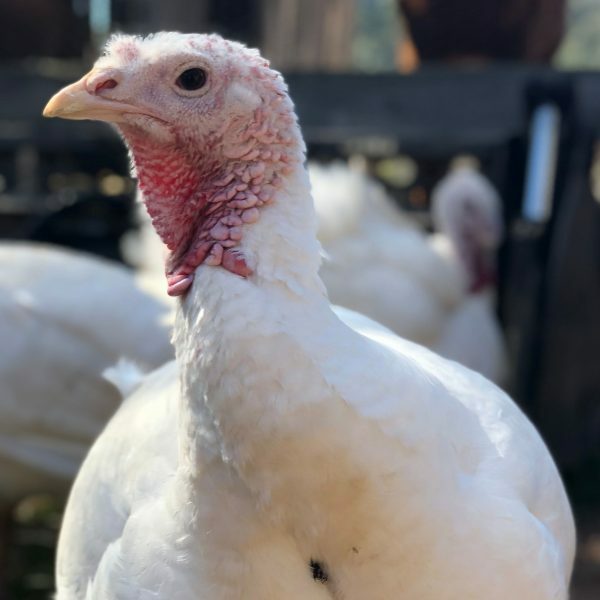 We are so happy that Banjo is now living a life of peace at the sanctuary and is a fearless ambassador for the millions of turkey who have a different fate. Banjo is someone, not something. As a sponsor, you will receive a beautiful colour photo-card of Banjo along with her personal profile. This will be mailed within five working days of receipt of order.